A group from Texas displays flags during an anti-abortion rally on the Mall in Washington, D.C. In Texas, a law placing further restrictions on abortion providers is in effect: All but seven clinics in the state have closed. But the law had an impact long before Thursday, when it was upheld by a federal court of appeals. According to the Guttmacher Institute, a reproductive health nonprofit, 14 percent of the roughly 533,500 pregnancies among Texas women in 2011 ended in abortion. After the new restrictions were passed, reports surfaced that the state’s abortion rate had fallen by 13 percent (or about 2 percentage points), leading to speculation about how the law had affected the rate of self-induced abortions. We may never know the answer to that question, but researchers at the Texas Policy Evaluation Project have looked at other tangible effects the restrictions have had and used that data to project how the final round of closures will affect women in Texas. Certainly, an increased number of women will have to travel farther to legally obtain an abortion. Before the new law was passed, no Texan lived more than 200 miles away from a clinic that performed abortions in the state. 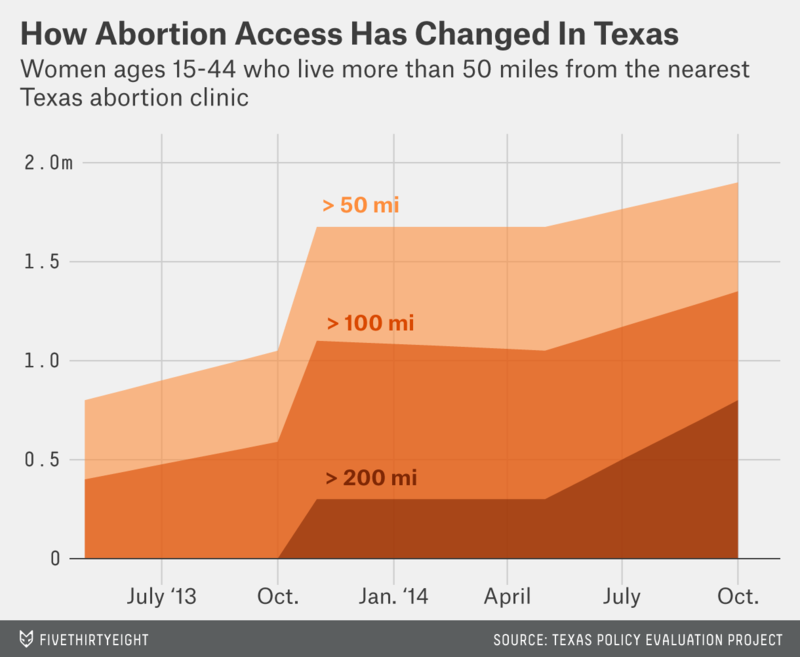 The closures mean that almost 800,000 women of reproductive age will live outside that range. With Texas law requiring a 24-hour waiting period after an in-person consultation, many women who make two trips to a Texas abortion provider will have to travel more than 800 miles total to legally obtain the procedure. And the clinics that are remaining open won’t have the capacity to help every woman who requests their services. A vast majority of the abortions performed in Texas were performed in Austin, Dallas, Houston or San Antonio even before the new law was enforced. But since November 2012, that share has increased from 83.5 percent to 90.5 percent. The number of these abortions that were performed at ambulatory surgical centers — the seven remaining clinics in compliance with the law — decreased relative to total abortions in the same period. While about 26 percent of abortions performed between November 2012 and April 2013 occurred in an ASC, only 22 percent of those performed between November 2013 and April 2014 did. Because such a low percentage of abortions would have complied with the new regulations, it’s highly unlikely that ASCs will be able to fulfill demand in the state.